The crisp, simple 1994 spire of this church is a landmark on the busy A14, and, along with those of neighbouring Woolpit and Finborough, creates an illusion of some more distant part of the country when seen through the autumn mist from the hills on the far side of the Gipping valley. 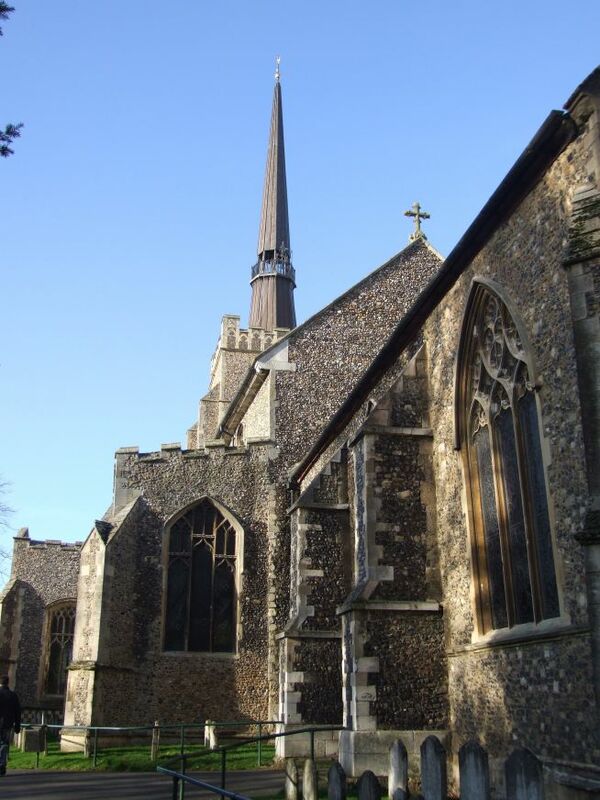 Suffolk doesn't have many spires, and this, perhaps, is the most elegant. 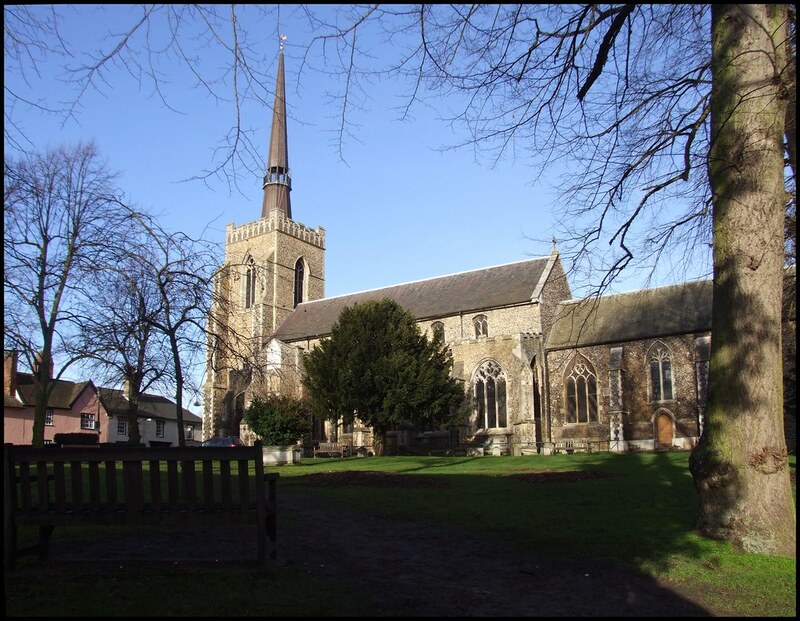 Coming closer, the surprise of a substantial country market town gathers to surround the church, and St Peter and St Mary sits right beside the busy high street of the sixth largest urban area in Suffolk. The north-west corner sticks out into the main crossroads, and there are three curious windows at the west end of the north aisle that face onto this junction. You wonder if there might have been a reason for this. But the church is cut off from the main shopping street by a barrier of buildings, its attractive tower peeping up behind a row of substantial 19th century banks. If you go up the passage to the church, you find that the graveyard has become a small, quiet park, with buildings on all sides. Most of the graves have been removed, or reset nearer to the church, apart from a few low tombchests, covered in moss and ivy. St Peter and St Mary is clearly not a possible medieval dedication. Churches were dedicated according to feast days in the ordo of the Catholic Church, and there is no feast shared by St Peter and the Blessed Virgin. The original dedication was probably to St Peter and St Paul. The modern dedication is a result of the dedications of two churches being combined. At Domesday in 1086, the church on this site (of which nothing survives) was the church for the vill of Thorney, which included Stowupland, Gipping, Old Newton and Dagworth within its boundaries. In the south east corner of this grassed area there once stood another church, a smaller one dedicated to a Marian feast, probably the Assumption. 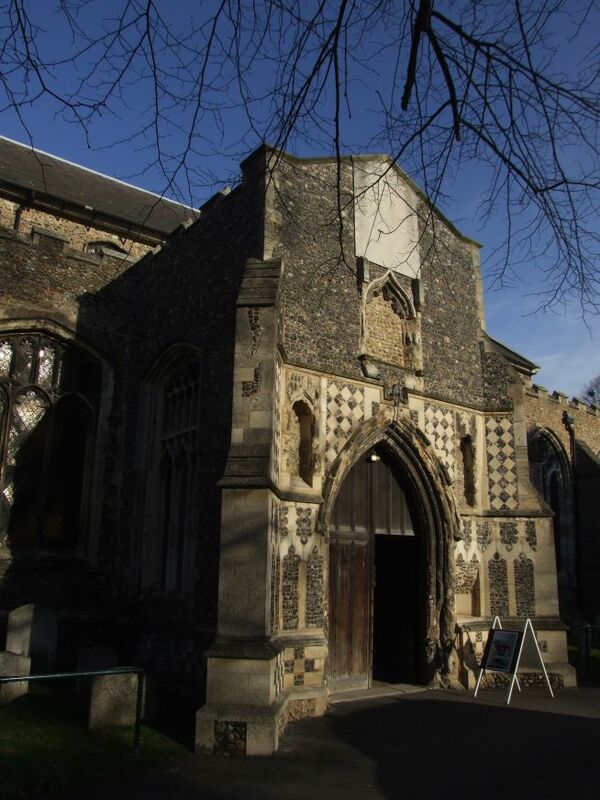 This was the town church for Stowmarket. The modern dedication takes on board that of both churches, then, for the town church was demolished in the 16th century, during the trauma of the Reformation. 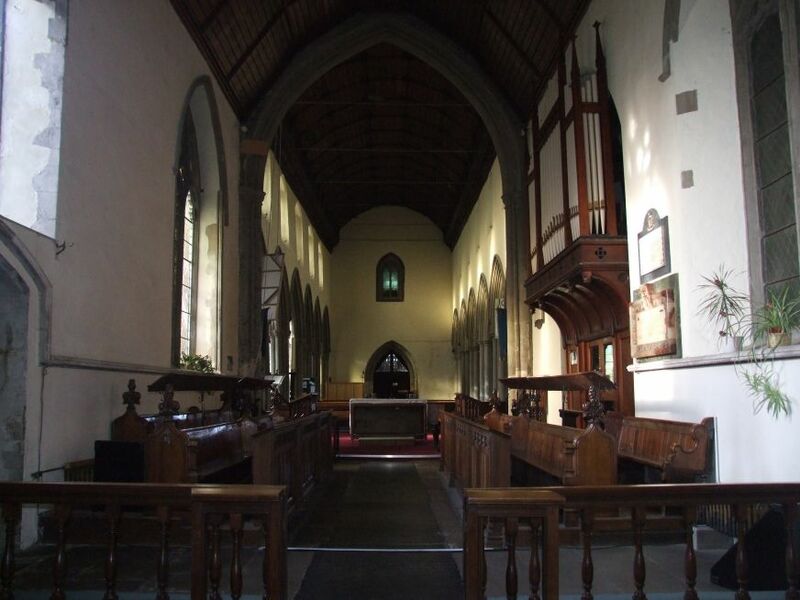 This is a large church, very much in the Decorated style of the 14th century. The spire has St Peter's keys in gold upon it, which we will come back to in a moment. 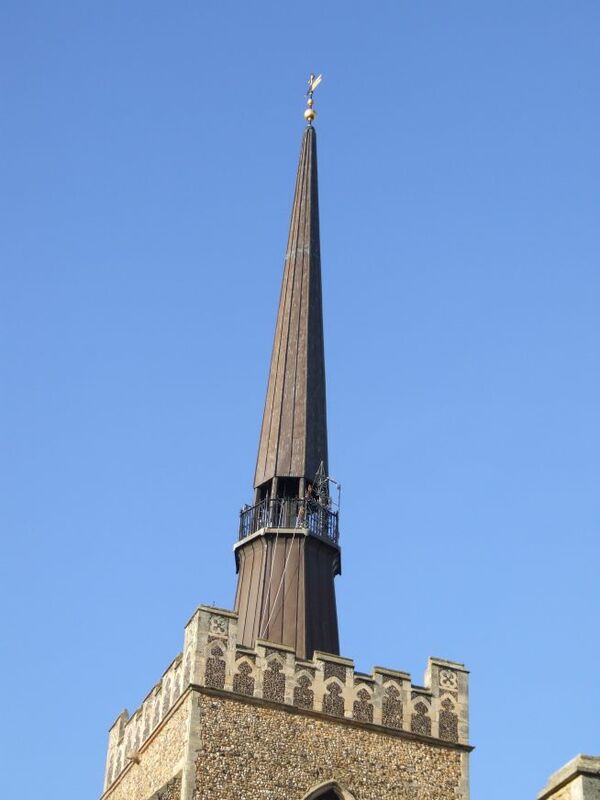 It replaced an 18th century spire, which was taken down as unsafe in 1975. There is a processional way at the base of the tower, as at Ipswich St Lawrence and nearby Combs. There is a massive 15th century south porch, not as pretty as the one on the other side, but bearing the marks of continual use over the centuries. When I first came to this church in the late 1990s, I sensed a siege mentality. Today, nothing could be further from the truth. St Peter and St Mary is one of the most welcoming town churches in Suffolk, as the array of signs leaning against the wall of the porch testify. There's one for Saturday mornings, when tea and coffee is served, one for other mornings in the week, when the church is also open, and special ones for Wednesday, when the building is open from dawn to dusk with welcomers on duty. The man I spoke to inside said that they plan to extend this to other weekdays as well. After the grandness of the exterior, stepping inside used to be a bit of a disappointment. 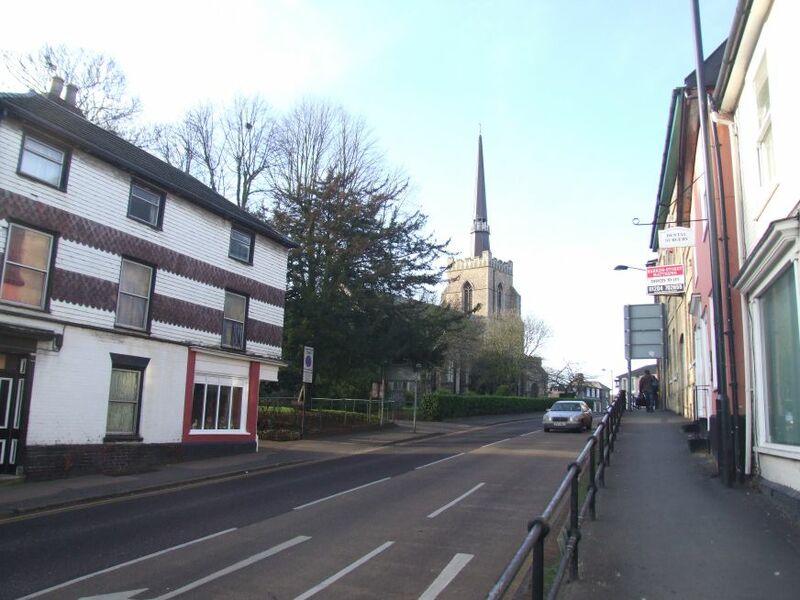 Stowmarket was a significant industrial town in the 19th century, and had a great tradition of protestant ministry. Because of this, very little that was medieval survived the Victorian restoration, which was by Diocesan architect Richard Phipson. It is interesting to compare this interior with that of Ipswich St Mary le Tower, another civic church reconstructed by Phipson. There, he was creating a liturgical space for the new Anglo-catholic theology of the Oxford Movement; here, the intention was more for a preaching space, although the usual Victorian sentimentalisms couldn't be escaped. Because of the tradition of this church, it might be that there wasn't much medieval for Phipson to destroy; Mortlock decries the restoration because of the loss of its fine 18th century furnishings, which were well documented. However, in recent years there have been energetic efforts to transform the once-dour interior. 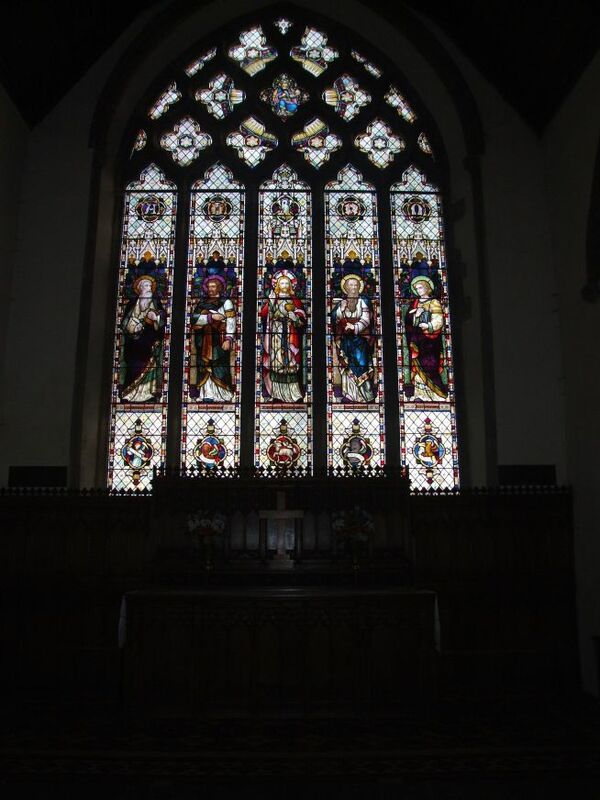 The dull Victorian quarries in the south windows have all been removed, and the four most easterly windows have been filled with excellent glass by the York-based stained glass artist Helen Whittaker. They depict the Four Seasons as four figures surrounded by a swirl of seasonal images, and verses from the Psalms. I thought they were very appropriate for the low church tradition of Stowmarket. 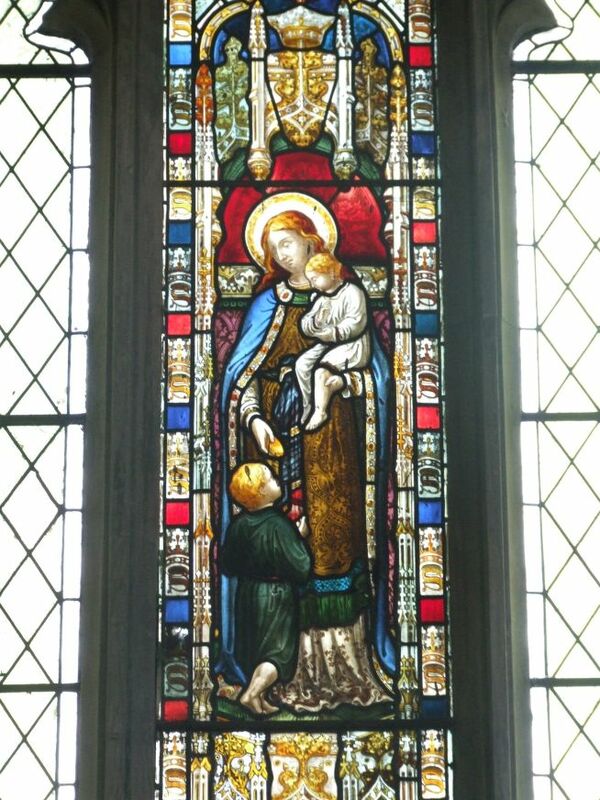 They at once traditional and innovative, much braver than so much of the typically mundane glass which has been installed in English churches since the Millennium. They were rather hard to photograph on this bright, early morning in January 2008, and so I must go back. Looking up to the clerestory, the quarries are still in place, but the leading is bulging alarmingly. The next part of the restoration will be to remove them, and replace them with clear glass with shaped leading. After that, the quarries on the north side will go, hopefully replaced by something equally as beautiful as the Four Seasons. The rather depressing massed ranks of Victorian benches will also go, to be replaced by modern wooden chairs. This should create a delicious, light-filled nave which will be a pleasure to sit in. 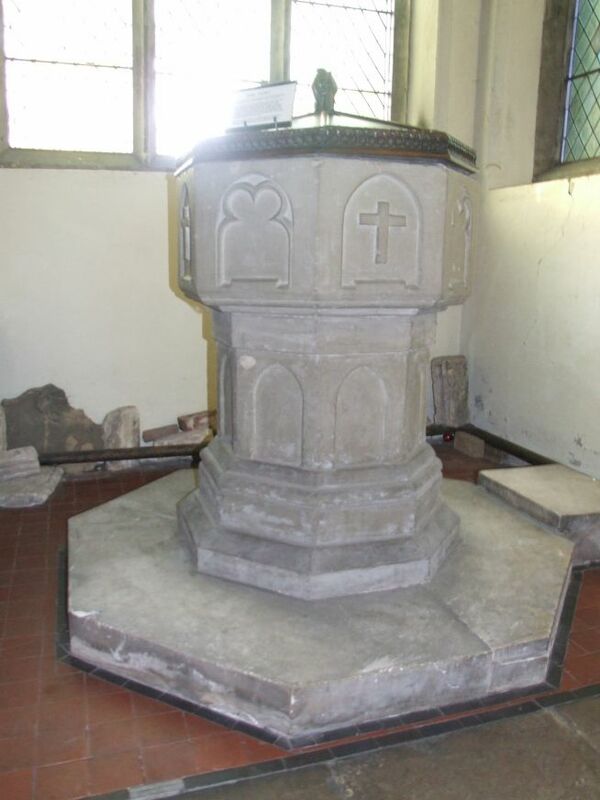 For the present, the font stands rather forlornly in the extreme south-west corner, a utilitarian recutting of something that might once have been 13th century. 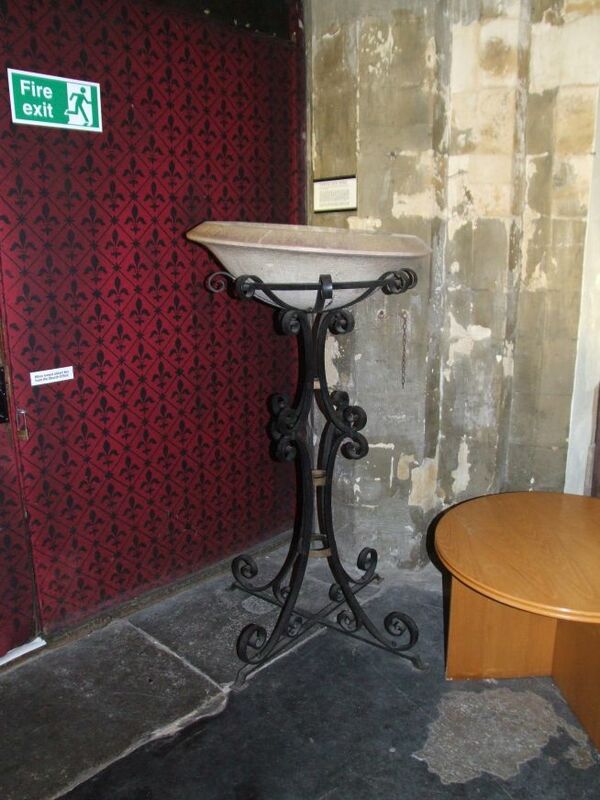 There is what appears to be an 18th century font on an iron base set beside the tower arch. 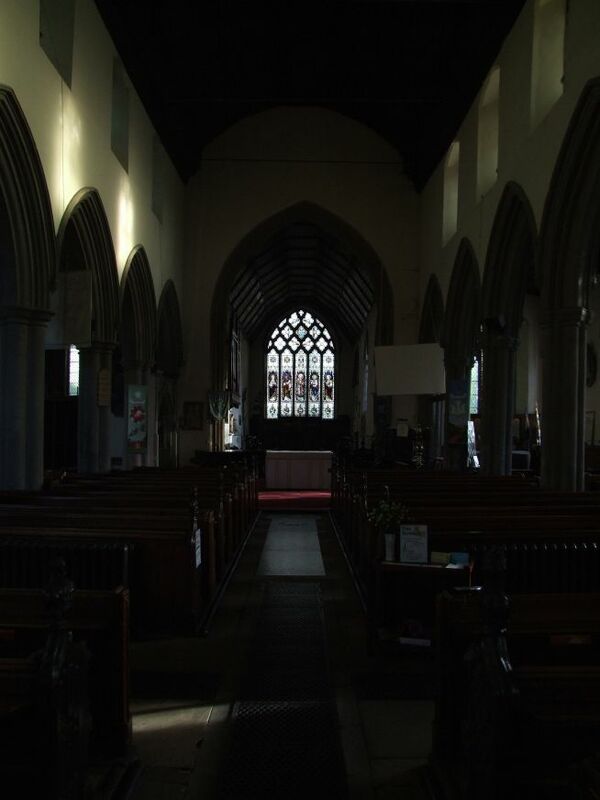 But turning to the east, the view is already a fine one; the altar has been brought forward into the nave, and the chancel behind is full of space. The main family associated with this church were the Tyrrells. They lived at Gipping, but were buried here, in the east end of the north aisle, which was their chantry chapel. 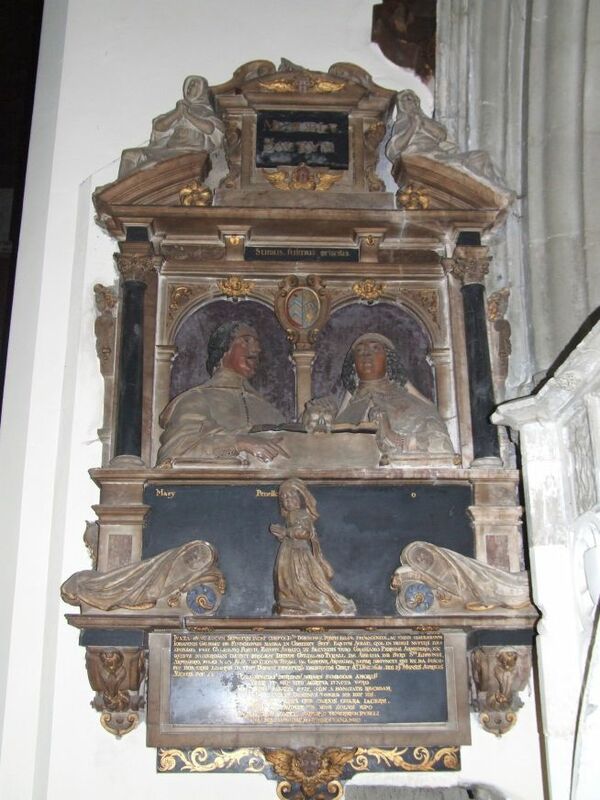 There are some excellent Tyrrell memorials of the 17th and 18th centuries, all worth a second look. Perhaps the grandest is the great tomb cover set in the eastern bay of the arcade, with its carvings facing into the nave; the sweetest is the brass to 8 year old Ann Tyrell, who died in 1638.There are benches at Gipping, decorated with the Tyrrell knot, that are said to come from this church originally. Across the church, the south aisle chapel now contains the war memorial, a delightful pre-Raphelite reredos, with gold and pastel shades. Phipson kitted this out as a Lady Chapel, but his parclose screen was removed in 1921. Some of the benches at the east end of the nave have fine medieval bench ends. 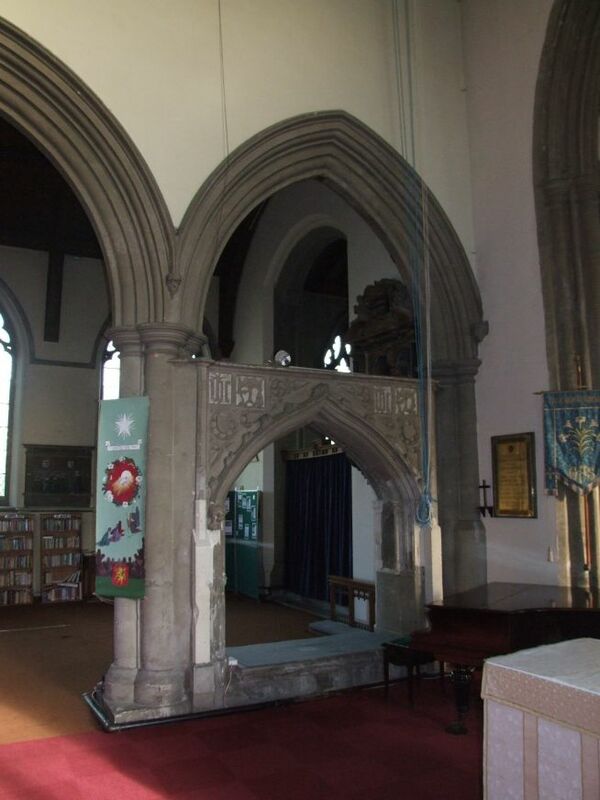 The rather curious pulpit is built using a frame of parts of the old roodscreen. Up in the chancel, Munro Cautley's ponderous altar looks on forbiddingly. The glass above isn't great, but in any case never had a chance. Stowmarket was a solidly reforming parish from the start. Most of the internal devotional art was destroyed in the 1540s, and a hundred years later that man Dowsing came that way to deal with what had been missed. On Monday February 5th 1644, on the last day of his first tour of Suffolk, he arrived at about lunchtime. We gave order to break down about 70 superstitious pictures, his journal records, and to levell the chancel, to Mr Manning, that promised it; and to take down 2 crosses, one on the steeple, and the other on the church as it is called; and took off an inscription, of 'ora pro anima'. William Manning was the churchwarden; in the new edition of Dowsing's Journal, Dr John Blatchly records that he was a leading citizen of the town. In addition, the Vicar at the time was Thomas Young, arch-protestant tutor of the young John Milton; Young, unsurprisingly, kept his incumbency into the Commonwealth period until his death in 1655. The 70 superstitious pictures would have been in stained glass, and it seems about the right number to have filled the east window. Thus, a great medieval treasure was lost to us. The chancel needed levelling because, in common with many churches, it had been raised above the level of the nave under the influence of Archbishop Laud, a decade earlier. Laud's intention was to recreate a sacramental space in the medieval manner, at a time when most churches were celebrating communion around a table in the nave. A few months after Dowsing's visit, Laud would go to the scaffold. The crosses were outside, of course, and Dowsing frequently took issue with them. Interestingly, David Davy's sketch of the church in 1842, before Phipson got his hands on the building, shows the stumps of two crosses on the gable ends of the nave and chancel. Maybe Dowsing is a little confused - he wrote his journal up at the end of a busy day, during which he visited seven other churches. But the churchwarden's accounts go further, and state that, in fact, it was crosse keys, the symbol of St Peter, that were taken down from the spire. As John Blatchly says, Dowsing would be displeased to see that they are now back there. The inscription ora pro anima means 'pray for the soul of', and was often found in pre-Reformation inscriptions. It is a sign of Catholic theology, and as such was anathema to the Puritans. Dowsing, a cautious, conservative man, usually only removed the part of the inscription that offended, rather than the whole thing, and rarely removed figure brasses. All the former brasses are missing from under the large tomb canopy, but they might just as easily have been stolen in later years. 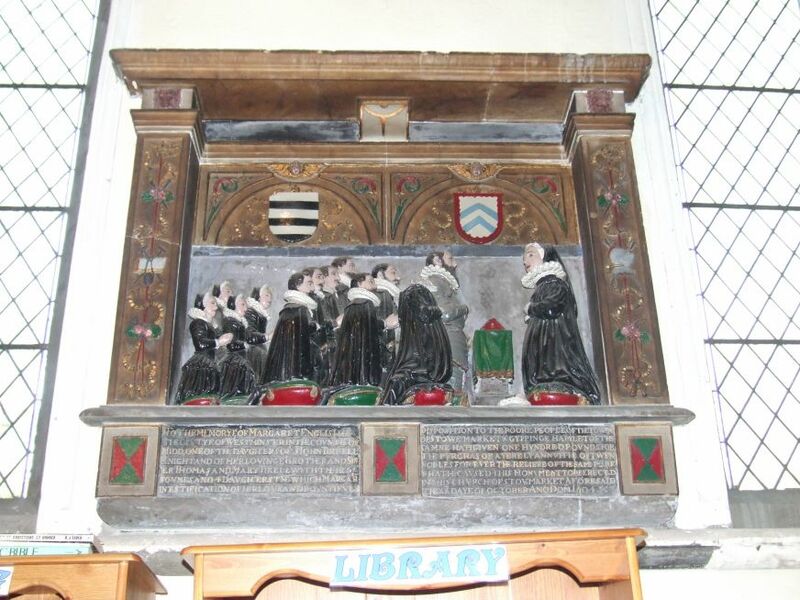 Curiously though, part of the inscription on the 1641 memorial to William and Dorothy Tyrrell has been obliterated. Now, this is a full century after the Reformation, and the paint on it can hardly have been dry by the time Dowsing visited, but the Tyrrells were notorious recusants, and that would have offended Dowsing greatly. Perhaps there was something in the inscription that did too. Puritans have long memories, and the part of the Tyrrells in trying to re-establish English Catholicism in the 1550s would not have been forgotten. Curiously, Dowsing did not visit Gipping itself, where the Tyrrells lived, and had their private chapel. Perhaps they were too powerful, but this doesn't seem right; the glass there was also destroyed. Maybe Dowsing simply knew it had already been dealt with. Any glass that survived Dowsing here would, in any case, not have survived the great Stowmarket factory explosion of 11th August 1871, which destroyed so much of the town, and killed so many. Do not come here, then, expecting to find medieval survivals. Come instead to find a great civic interior of the 19th century being slowly developed for the community of the 21st century. I was so pleased to come back here, and see such a transformation. When I first visited in the 1990s, the chancel had just suffered a serious arson attack. On an unrelated matter, the Vicar had left his post because of financial irregularities. Not unreasonably, it felt as if heads had dropped in the parish. But what a difference a decade makes! This is probably a little-visited church by outsiders. Stowmarket isn't particularly a tourist town. But this church is undergoing a renaissance. 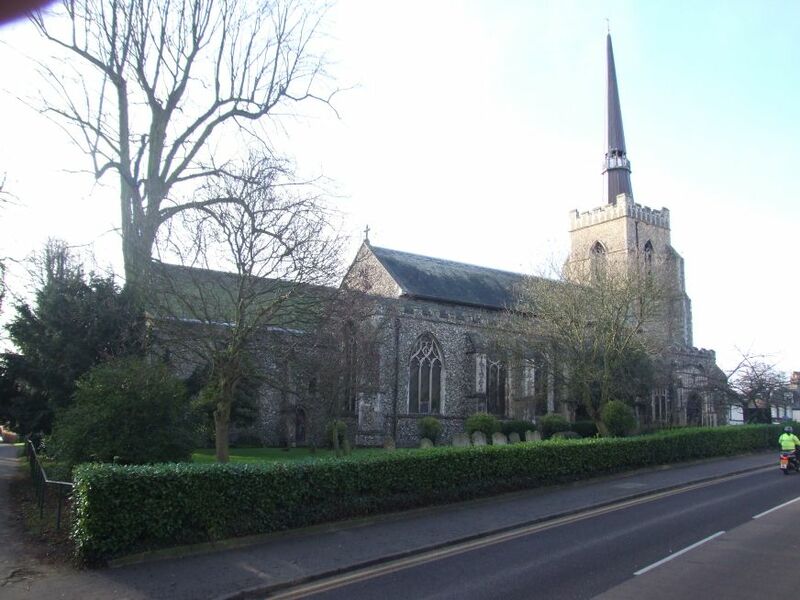 The parish are committed to it being used by the town for concerts, meetings and other events - it is, after all, the only substantial public space in Stowmarket. See it now, and watch it be carefully nurtured over the years ahead.